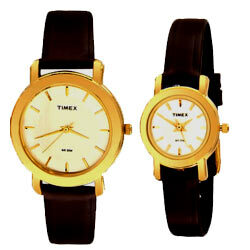 Present this Astonishing Pair of Watches from Timex and make the recipient’s day special. This pair of Watches features Black Coloured Leather Strap and Round Shaped Dial. This pair of Watches also comes with 9 months Warranty.